Sometime in the fifty years between 1200 and 1150 BC there was a catastrophic collapse of much of the civilised world including the Mycenaean Kingdoms, the Hittite Empire and the Eastern Coast of the Mediterranean. Every important Bronze Age site from Troy to Gaza showed ‘destruction layers’ from sacking and burning. Anatolia (Turkey) did not recover to a similar level of civilisation for another thousand years. Hattusa, the Hittite capital, was burned and forever abandoned. Troy (VII) was burned more than once and briefly abandoned during the Greek Dark Ages. It did not regain it’s prominence until Roman times. It was most likely the first of these sackings (Troy VII a) that inspired the great legend of the fall of Troy. None of the Mycenaean palaces of the Late Bronze Age survived. The destruction was heaviest at palaces and fortified sites but up to 90% of even small sites in the Peloponnese were abandoned, suggesting a major depopulation. Literacy was lost. The great city of Mycenae was never reoccupied. It ushered in the “Greek Dark Ages” that lasted for four hundred years and led to a cultural memory in the Archaic period of a lost 'golden' age ('the Works and Days' Hesiod). Egypt struggled for a while, after losing its empire (Syria and Canaan), before finally succumbing in mid twelfth century BC (during the reign of Ramses VI). Ugarit, the great trading city on the north coast of Syria, a client city of the Hittites, was never re-occupied. It had an extensive (clay tablet) library and gives us some of the best accounts of the time including a plea from Ammurapi, their young king, to the king of Cyprus. “My father, behold, the enemy's ships came (here); my cities(?) were burned, and they did evil things in my country.” He had sent his ships and chariots to defend the central Hittite region from the disaster overtaking them all. The written records are best in Egypt and Ugarit but that was only a small (but important) part of a great cataclysm. The collapse and destruction reached as far as Italy (e.g. the ‘Terramare’ (black Earth) culture of the Emelia region) and destroyed all other Mycenean sites ( Northern Greece, Sicily, Crete, the Mediterranean and Adriatic islands, Albania, the Dalmatian coast and maybe southern Italy). There were massive dislocations of entire peoples even as far away as southern Britain (where there was an invasion of proto-Celtic people of the Urnfield culture). It extended all across Europe, the Middle East and Central Asia. In Greece it was the time of the (now discredited) Dorian invasion, but when the dust settled centuries later, Greeks had a new culture and new dialects and many new people had arrived in their north and in Anatolia. Aramaic speakers had arrived (or spread out) in the middle East and the Aryans (Persians) had arrived in Iran, finally conquering the last of the Elamites. For thirty years Egypt and the cities along the East Mediterranean coast had suffered from devastating raids of the ‘sea peoples’ attacking Egypt and cities along East Mediterranean coast. Though it is not known for sure, it is likely that most were not adventurers looking to take advantage of the sudden weakness of wealthy sophisticated countries. Most were fleeing war and famine, looking for new homes. Two of the sea peoples established or resettled cities: the Philistines (Myceneans) were discussed in my earlier blog here and to the north in what is currently Israel, the Sherden (likely Nuragic Sardinians) established El-Ahwat (meaning 'the walls'), mentioned in the bible as Harosheth Haggoyim. The Israelites didn't seem to like them any more than they did the Philistines and the Sherden, for all their prowess, had moved into a dangerous and difficult world. Their city, and their people, barely lasted fifty years. Coming back to the last king of Ugarit, invaders were not the only problem for the young king. Eshuwara, the senior governor of Cyprus, wrote back warning him that “(it was) the people from your country (and) your own ships (who) did this!” Like a rebellion on the Titanic, they were fighting amongst themselves. The surrounding land and the great city was laid waste and sacked by its own people, at a time when the world was crashing down all around them. The ruler of Carchemish in northern Syria sent help, but it arrived too late. Robert Drews, Professor of Classical Studies at Vanderbilt University, describes it as "the worst disaster in ancient history, even more calamitous than the collapse of the Western Roman Empire". So what was the cause? Brevity means I need to skim over some of the controversies. It was not iron weapons. Iron had been known about in the Bronze Age Anatolia for hundreds of years, but the high temperatures needed for smelting it and the low carbon products (iron, not steel) made it an inferior substitute to Bronze. Warriors with cheap quickly produced iron long-swords sometimes had to straighten them before battle. In areas where tin continued to be available such as Great Britain with its tin mines in Cornwall and Devon, bronze was still preferred (the ‘Atlantic Bronze Age’ lasted till 700 BC and the ‘Nordic Bronze Age’ till 500 BC). Iron was suitable for spears, arrow heads and short swords but was only introduced into weaponry as tin became hard to get. Besides, the invading forces used bronze, so the point is rather mute. Nor was it so called 'new infantry techniques or weapons' (which some theorists point to with no justification that I am aware of). They talk of throwing spears and shields as if they are somehow new. It is true that one subgroup of the invaders (the Sherden) did have a new type of bronze sword (and kilts and horned helmets) and gave the Egyptians a lot of trouble, but this was only one group and a new type of sword that wasn't enough advantage to explain such devastation and its aftermath. Infantry simply could not resist the mobility and hit and run technique of light chariots, where they could be employed. In fact, the invaders were careful to bring their own chariots with them (disassembled on their ships) and used them in concert. Even after the fall, for more than a hundred years, the might of an army was measured in chariots until their slow decline (over the next thousand years) starting, not with the advent of new infantry techniques, but horse archers (introduced into the region by Aryans and (Neo-)Assyrians). So why were the invaders so successful? A large part of the answer almost certainly lies in numbers. As history has shown again and again, it is hard to impossible for a standing army to counter the mass migration of a warrior people, and it is difficult to counter the hit-and-run tactics of coastal raiders. To add to this, the regions that were worst affected were already fatally weakened. The great Dravidian culture of the Indus valley had fallen half a millennia or more before, due to a combination of climate change and the Aryan expansion and we now understand something similar but on a far larger scale triggered the Bronze Age collapse. Multi-site examinations of pollen samples show a long, very dry, period lasting 150- 300 years. A climatologist suggested that something like the North Atlantic Oscillation caused mid-winter storms coming from the Atlantic to be diverted to north of the Pyrenees and the Alps, bringing colder wetter conditions to Central and parts of Northern Europe, changes in sea temperature affecting cod fishing, and drought to the Mediterranean. The drought would impact on dry farming and herding, but also reducing river flows and annual flooding. Civilisation, with specialisation, supports an almost infinitely larger populations than the typical hunter gatherers on a similar site but it requires trade. Initially this is local trade, but the bigger and more sophisticated the city becomes the further away might be its food supply. Disrupt this by sustained raiding of sea and land routes or burning of farms and killing farmers and the system falls apart. Almost by definition, the Bronze Age kingdoms were not self sustaining. At a minimum they required tin, which is relatively uncommon, to be sourced from places like Afghanistan. The scope and intricacy of the trade was stunning. It formed a complex web stretching across the known world from the Himalayas to the Indian Ocean. 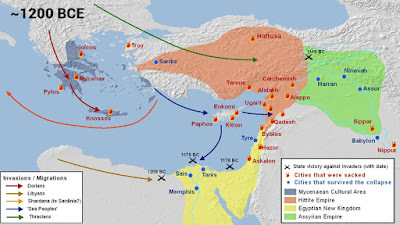 It also involved food, several Hittite cities relied on Egyptian grain for their survival and the Mycenaean world would have relied on the rich grain fields north of the Black Sea. The latter became arid, trade became disrupted and the area depopulated. So, the enduring famine and drought triggered a cascade of civil unrest, mass migration, war and destruction which in the end became impossible to recover from. Philistines and the ‘Sea People’ who were they? In the half-century between c. 1200 and 1150 BC the Mycenean Kingdoms, the Kassite dynasty of Babylonia, the Hittite Empire, many Canaanite cities began to fall like dominoes. They (and Egyptian Empire) were caught up in drought, famine, disruptive people movements, war, depopulation and ensuing illiteracy over much of the known world. 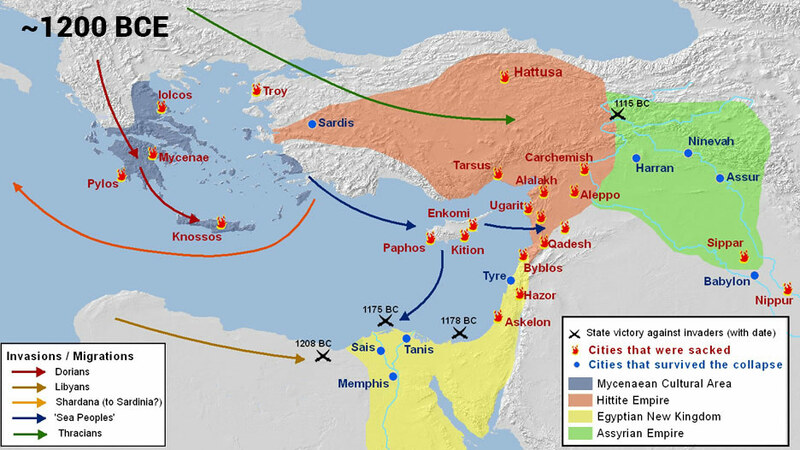 This was the time of the Bronze Age collapse (which I plan to discuss in a separate blog). The arrival and origin of the Philistines is caught up in both this time and the mystery of the 'Sea People', best known from Egyptian accounts as savage raiders attacking in great numbers along the Mediterranean coast for maybe a century through to 1178 BC. The ones that attacked the Egyptians were a federation including people from Canaan and Libya and a large number of people variously described as ‘people of the sea’.In time of Ramesses III 1180 BC, the Peleset (from Hebrew Peleshet (meaning Philistine)) were first included in the list, at time of unimaginable wide spread slaughter and collapse. 'No land could resist their arms, from Hatti, Kode, Carchemish, Arzawa, and Alashiya … They desolated its people and its land was like that which had never existed … They laid their hands upon the lands as far as the circuit of the earth, their hearts were confident …' Ramesses III's reliefs show carts loaded with women, children, and household goods amongst the attackers. They weren't just there to raid, they were looking for new lands to settle. The Israelite term (Pelesheth) means a region on the S. Mediterranean coast of Israel, (similar in origin to Palestine) . Philistine simply means the people that lived in that region. So calling them ‘Philistines’ doesn’t tell us anything about who they were, and attempts to use the name 'Philistine' and any similarity to the names of other people and regions is spurious. 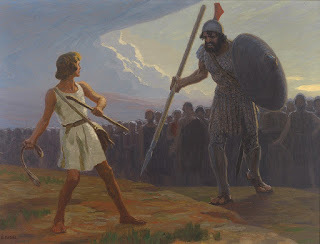 In fact the early (and more friendly) Philistines (mentioned in Genesis) were Canaanites, but that changed after the Bronze Age Collapse to be a new people who (according to the Bible at least) were both hated and feared by the Israelites. Their culture was centred around the five city-states of the southwestern levant : Gaza, Ashkelon, Ekron and Gatha. The last level of Canaanite occupation at these sites shows a layer of violent conflagration, and after a few decades there was reoccupation and a marked change in culture . Much of the archaeological record show Mycenean pottery (Late Helladic 111C) pottery, Mycenaean megaron buildings and Aegean burial, all supporting a Mycenean origin. 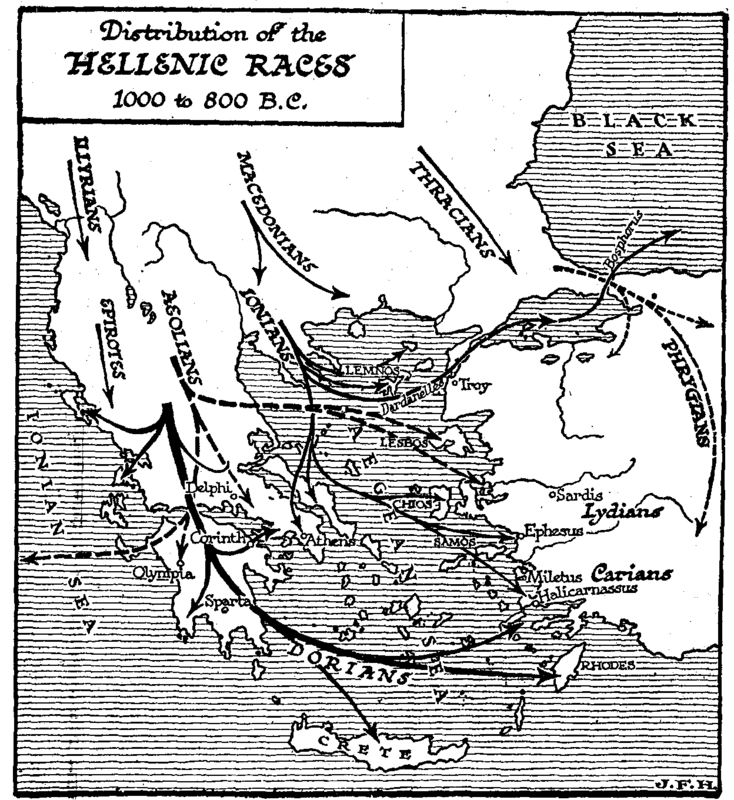 There were other significant migrations of Greek-speaking peoples to Sardinia and Sicily at the time and (as mentioned) the collapse of Mycenean society. 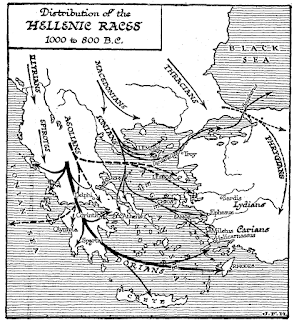 Some have suggested this was the time of the somewhat discredited ‘Dorian invasion’ of Greece coming (initially) over land from the North. A few Israelite references point to Crete as the origin of the Philistines. A small number of artefacts found could have been influenced by bulls. Crete had been in Mycenean hands for some time by this stage. The ‘Minoan Eruption’ occurred in approximately 1600 BCE. Crete might have been a handy stepping off port for a fleet of ships but if there was a contingent from Crete, even a large one, this would be Mycenean, not Minoan culture. The similarity of ‘Peleset’ and ‘Pelasgoí’ caused false speculation that the two might have been etymologically related. The Pelasgoí were only a power in the early Bronze Age until they were absorbed by the Minoans. Their small islands could not possibly support the great numbers described. Wherever the new Philistine settlers came from, in a few short centuries their culture became merged with and finally completely eclipsed by the local culture. They adopted Canaanite Gods, pottery, freely intermarried (usually more successfully than Sampson’s marriage to Philistine Delilah) . While they had their own (poorly attested language) they were soon speaking a Phoenician dialect easily understood by the Israelites and many had Canaanite names. One possibility might be that the original numbers of the Mycenean Greek settlers were relatively small and they welcomed Canaanites amongst them in considerable numbers until the Canaanite culture began to become dominant. The archeologically record shows brilliantly organised and productive cities, wine, perfume, and interest in personal hygiene (They certainly were not 'Philistines' in the modern sense of the word). Why didn’t the Israelites like them? This is a very murky time and our best record is the Bible. Unfortunately some parts of the Bible were written and added to long after, and sometimes many centuries after, the events described. 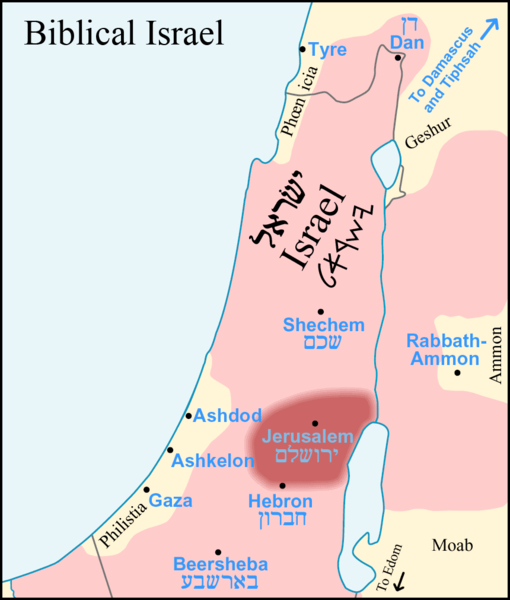 The Biblical description of the large, very rich ‘Golden Age’ United Kingdom of Saul, David and Solomon emerging around 1030 BC (see map) isn’t supported by the archaeological record. Judah and Jerusalem were said to be thinly populated at the time. Putting this aside, if the Biblical record is accepted at face value, God promised the land of the Philistines to the Israelites and “you shall drive them out before you.” Exodus 23:31 . In Joshua 13:1–3 God lists them in the lands yet to be conquered. Such war-like attitudes have not been uncommon throughout human history. While there is some evidence of good relations and intermarriage, perhaps some conflict with the Philistines was inevitable. The Philistines were already being absorbed into the local culture. Unless David conquered them, they may have maintained their independence till they were forced to pay tribute to Adad-nirari III (810–782 BC), an Assyrian King. By the early part of the 7th century BC they were vassals of the Assyrians. In the second half of that century, they became Egyptian vassals and they were conquered in turn by the Babylonian king Nebuchadnezzar 11 (605 BC – c. 562 BC) after which they faded from history as a separate cultural or political group. It was the same Nebuchadnezzar who besieged and looted Jerusalem, destroying its temple and taking some Israelites into captivity.